Arnold van Huis is a tropical entomologist at Wageningen University in the Netherlands. He's here today to answer our questions about edible insects and why you should probably consider eating a bug. van Huis was the first author for the UN paper Edible Insects: Future Prospects For Feed and Security (which you can check out here.) Global demand for meat is projected to increase by 80% by 2050, a demand that's going to be difficult to meet under current conditions. Edible insects, however, are easily raised and nutritious. van Huis' research focuses on both the insects themselves and on just how they might become accepted in diets where they're not yet familiar. He'll be joining us from 10:00 - 11:00 a.m. (Pacific time). Ask him whatever you want about the 1,900 species of edible insects currently consumed around the world, the future of eating meat and insects, and the best ways to cook with insects. 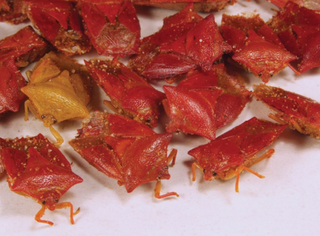 Top image: Cooked shield bugs / Marcus Harrison, FAO. Bottom image: Bee larvae granola with bee larvae yogurt at the Nordic Food Lab / Josh Evans, FAO.